The exact origin of the contemporary powwow is difficult to pinpoint but has its roots in traditional gatherings and tribal dances for particular situations. As American Indians were moved onto reservations, their dancing was curtailed by government regulations and so became a powerful symbol of Indian identity. Since the turn of the twentieth century, the intertribal powwow has rapidly developed into a form of expression recognizable to American Indians throughout the continent. 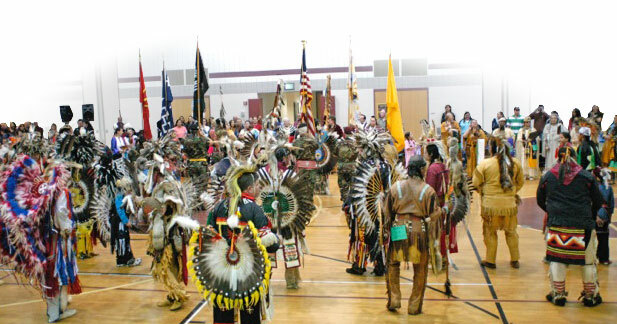 The dance and dress styles characteristic of the contemporary powwow owe much to the Northern and Southern Plains peoples, but have spread and adapted to the changes within Indian cultures, powerfully symbolizing both tribally specific and American Indian identity. The contemporary powwow is a social event, like a big family reunion where everyone comes to renew acquaintances and to dance. It is a time for people to come together in song and dance, a time to put aside tribal differences and help bridge the gap between the American Indian and the non-Indian worlds. However, powwows are not simply secular opportunities for fun; they are a prayer to the Creator, a celebration of spirituality, and a connection with Indianness of past, present and future. There are two types of powwows: the traditional or honoring powwow, and the non-traditional or contest powwow. Honorings are an important part of the traditional powwow like ours. Several units at Penn State help sponsor the Penn State Powwow. They are: Donald P. Bellisario College of Communications, College of Earth and Mineral Sciences, College of Education, Outreach and Online Education, Penn State Alumni Associaiton, Schreyer Honors College, Student Affairs, Office of Undergraduate Admissions, University Libraries and Scholarly Communications, and the Office of the Vice Provost for Educational Equity. *-All drums and vendors for the powwow participate on an invitation-only basis.